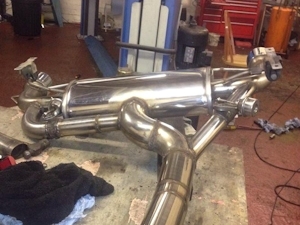 We are now an authorised Milltek exhaust systems dealer, click to see more. At VAG Auto Care Services we have built up a reputation as a trusted partner for installing performance upgrades and conversions for our customers from all over the UK. 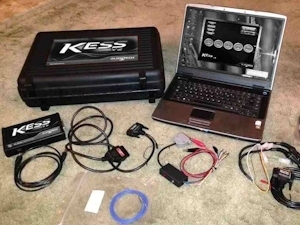 We can perform numerous perfornance upgrades depending on your requirements, perhaps you just need to update your car's performance with an engine remap? Perhaps you have purchased a performance part but are not confident to install it to your car and need our help? Our performance installations include anything from a simple air filter installaton all the way up to advanced high power turbo charger conversions and engine transplants. We have installed numerous HGP turbo conversions to 3.2 VR6 engines in both MK4 / MK5 Golf models. We have performed various engine conversions including both Golf and Bora 2.8 VR6 4 Motion models converted to 3.2 VR6 R32 engines. We have even converted super charged cars to turbo charged cars and then installed the removed super charger to another customer's car. All of these performance enhancing upgrades require the car to also have stable suspension / brake setups to handle the extra power / speed the cars are capable of (where the law permitts) . 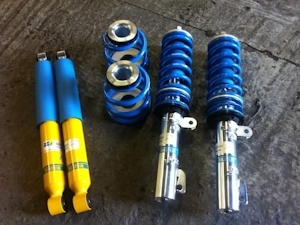 We can install upgraded suspension parts such as anti roll bars, bushes, coilover suspension etc. We can install upgraded brakes to add safety to the performance. Please see some of our offerings below and give us a call to discuss your requirements. We have performed numerous engine conversions for our customers in the past. One of our customer cars was originally a Bora 2.8 4 Motion which was upgraded to an R32 engine and eventually to a 3.2 HPA Turbo setup. 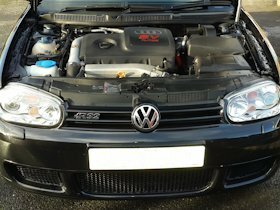 We also installed a Audi 1.8T 20V 225 engine into a Golf MK4 R32 shell for one of our customers, with the result looking and driving as if VW had built this car, a true factory standard / style OEM installation, we believe the first time this has ever been done. 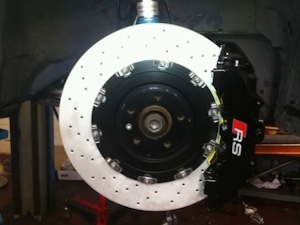 We have also installed Golf MK4 334mm R32 brakes and Brembo brakes onto TDi / 1.8T / 2.8 models. For high power Turbo VR6 applications we have previously installed Audi B7 RS4 and Porsche brakes. We can install suspension upgrades including (but not limited to): Coilover suspension, upgraded anti roll bars, upgraded bushes, upgraded / adjustable rear control arms. We have also assisted customers that wanted to refresh their tired looking suspension components and have wanted to install restored (freshly power coated / painted) wishbones, hubs, subframes etc. Call us to discuss your requirements on any performance upgrades.